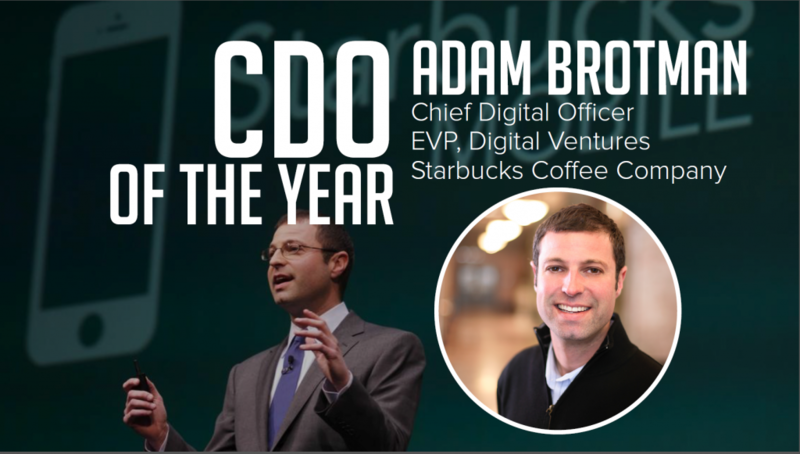 NEW YORK, April 29, 2015 – CDO Club, the world’s first and largest community of C-suite digital leaders, with over 1,000 members, today named Adam Brotman, Starbucks Coffee Company’s Chief Digital Officer, the 2015 U.S. Chief Digital Officer of the Year. Brotman was named the recipient of the award during CDO Club founder David Mathison’s keynote presentation, “Hall of Fame: CDOs Who Have Become CEO and Board Directors,” at the 3rd annual CDO Summit, sponsored by Capgemini, on Wednesday, April 29, 2015, and hosted at Thomson Reuters in New York City. “I really want to thank you for this recognition, but I can only accept this on behalf of the entire cross-functional team at Starbucks who work every day to bring our digital platforms and experiences to life. Everything we do is a team effort here, and so this recognition belongs to the team more than me. I wish I could be there in person, of course. And would have been – but I am in Dallas at the quarterly Neiman Marcus board of directors meeting today, and couldn’t get there in time. Brotman joined Starbucks in April 2009, and under his leadership the company has become a leader in mobile payments, with more than 18% of its U.S. store transactions occurring via mobile. Additionally, the company processes more than 8 million mobile payments per week. 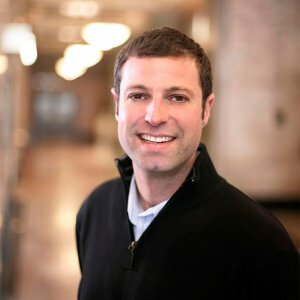 Starbucks Coffee Company’s Adam Brotman named U.S. Chief Digital Officer of the Year 2015 http://t.co/hVRupbPNm0 congrats @adambrotman! Brotman also led the team responsible for piloting Starbucks Mobile Order & Pay in 2014, a mobile ordering feature integrated within the Starbucks app that allows customers to place their order as well as pay for their food and beverage items in advance of visiting their store. The feature has been rolled out in 650 locations in the Pacific Northwest. The program has resulted in Goldman Sachs choosing Starbucks Corporation as its “top pick in restaurants,” reported the Wall Street Journal. 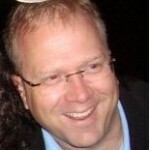 Brotman previously served as Starbucks senior vice president and general manager of Digital Ventures, where he led the enterprise digital platform strategy, roadmap, and delivery for core Web and mobile offerings, including the Starbucks Digital Network, Wi-Fi, StarbucksStore.com, Starbucks mobile apps, and Starbucks.com. Before joining Starbucks, Brotman was CEO at Barefoot Yoga Company, a Seattle-based e-commerce company. He served as senior vice president at the digital image licensing and e-commerce company Corbis, and founded PlayNetwork, Inc., a leading provider of in-store digital media and entertainment services for businesses worldwide. This is the third CDO of the Year award given in the U.S. by the CDO Club. The first-ever CDO of the Year award was bestowed in February 2013 on Teddy Goff, who served as Digital Director at Obama for America in 2008 and 2012. The second award was given in April 2014 to Rachael S. Haot, former Chief Digital Officer of New York City in Mayor Michael Bloomberg’s administration, and currently serving as Chief Digital Officer of New York State in Governor Andrew Cuomo’s administration. NOTE: The CDO Club is now a membership site. You’ll need to register in order to continue enjoying our posts. To register or for more information, click here. 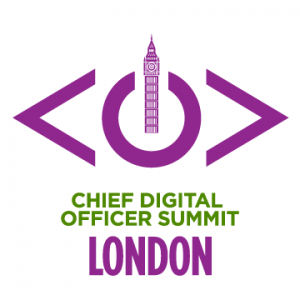 If you are tasked with understanding what digital leaders must do in order to succeed in almost any industry, the best place to learn more is at the Chief Digital Officer Summit.